Happy Friday!! Two of my favorite trends for spring: the color mint and colored jeans. Mint jeans is the combination of these two big trends and I can tell you for certain that it is one of my favorite pieces to wear this season. After wearing them so much, I concluded that I needed to gather all of my mint jean looks to form my first ever "5 Ways Fridays" where I show you how I wore an item in 5 different ways. Hope you like it! wow i really love all of the outfits and the mint green jeans! gorg! I really love the polka dot version. I really like all the versions though. I just got a polka dot top too so you just inspired me. Style three is my face!!! Ur adorable! I can't decide what look I like the best, all of them are great! Thanks for the ideas!! They look so good on you! Go girl! Wow! I love of all your looks! Mint jeans look great on you!! I did a similar segment with mint jeans too! I'd love to hear your thoughts! I'm one of your followers on here and I'm also going to follow you on chicisimo too! This is awesome I need to get me a pair asap! I love these mint jeans. All of the looks are darling. My favorite is with the polka dots. 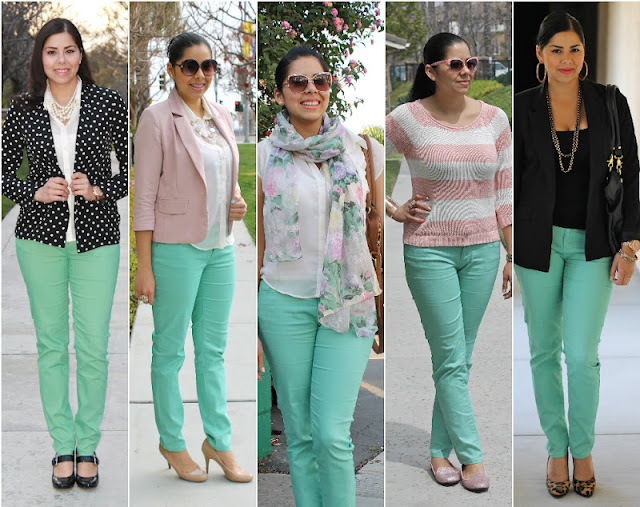 i really like all the different ways you styled these mint jeans.great post! Mint has been my fave colour this season. Love your pastel & floral looks the best! I adore it all Paulina!!! You are so clever with your style-pairing... I would wear each and every outfit here. My favs are probably polka dots and leopard. Well done! It's hard to decide which one is my favorite! I like all of them! lol You look so fresh and chic Pau! I love the floral look with those jeans! I love the mint green! I need those in my life! Please check out my blog, I'm new here! Thank you!